Lichens are unique, double organisms that consist of two unrelated components, an alga and/or cyanobacterium (pho-tobiont) and a fungus (mycobiont). The organisms that make up the lichen live in a close symbiotic relationship in which the photobiont gains mechanical protection, increased water availability, reduced desiccation, and an improved ability to obtain nutrients from the mycelium of the fungus. The fungus, in turn, gains organic nutrients synthesized by the photobiont(s) that is, a source of carbohydrates for growth. If an alga and a cyanobacterium are both involved, then the alga also gains a source of nitrogen. Recent research with modern lichens suggests that the relationship between the partners, although stable, may be highly variable, ranging from mutualism to parasitism. Although the thallus organization of most lichens suggests that they would be easily preserved, there are relatively few substantiated reports of fossil lichens of any antiquity. Hallbauer and van Warmelo (1974) described a putative fossil lichen from the Precambrian of South Africa under the name Thuchomyces lichenoides . It consisted of a horizontal thallus with a cortex of erect columns <5pm high. 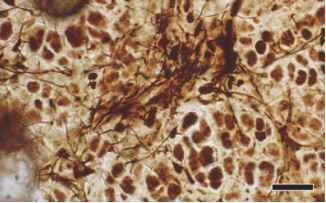 The cortex included several zones of branched, septate hyphae suggestive of certain types of lichens. A more recent interpretation is that T. lichenoides was a parasitic, filamentous microorganism (Hallbauer et al., 1977). The occurrence of these structures in rocks that were no doubt strongly heated during diagenesis (a gold-bearing, uranium-lead-oxide conglomerate) makes their assignment as lichens perhaps less convincing. Interestingly, similar filamentous structures have been obtained in the laboratory abioti-cally using comparable preparation techniques (Cloud, 1976). 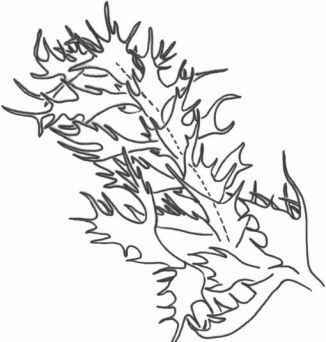 One structure that may represent some type of lichen symbiosis is a fossil termed a biodictyon (Krumbein et al., 2003b). A biodictyon is part of a biofilm that penetrates the surface on which it grows and forms a three-dimensional net-like structure. Certain types of biofilms have been reported from as early as the Precambrian (Barghoorn and Tyler, 1965). Net-like structures have been described from phosphorites from the famous Neoproterozoic (551-635 Ma) Doushantuo Formation Lagerstätte in south China (Yuan et al., 2005). What makes these fossils so lichen-like is the presence of groups of coccoid cells (cyanobacteria or algae) within the spaces of what appears to be a net of fungal mycelia (FIG. 3.119 ) . The specimens were deposited in a shallow subtidal environment and the site has yielded abundant algal fossils. Although the association of the coccoid cells and the hyphae of the net cannot unequivocally demonstrate a lichen symbiosis, the ordered arrangement of the cells of the two symbionts in the fossil indicates a regular and close physiological relationship between the two organisms. Molecular clock estimates from living lichens have also suggested that lichen symbioses may have existed during the Precambrian. 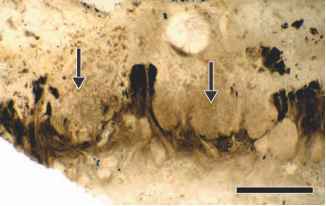 FIGURE 3.120 Section of thallus of Winfrenatia reticulata showing hyphal pockets (arrows) with cyanobacteria inside (Devonian). Bar = 800 pm. 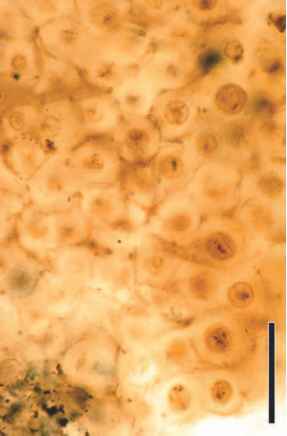 FIGURE 3.121 Hyphal net of Winfrenatia reticulata enclosing cyanobacterial unicells (Devonian). Bar = 60 pm. FIGURE 3.122 Cyanobacterial cell from Winfrenatia reticulata showing thickened sheath (Devonian). Bar = 10 pm. 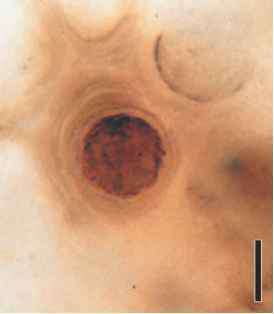 FIGURE 3.123 Eight-celled stage of Winfrenatia reticulata cyanobacterium (Devonian). Bar = 10 pm. to the Proterozoic fossils of Yuan et al. (2005). In addition, lichen symbioses represent a type of controlled parasitism, and lichens are believed to have evolved from true parasitism to the more mutualistic relationships seen in many modern taxa. Flabellitha is a leaf-like film interpreted as a lichen from the Devonian of Kazakhstan. 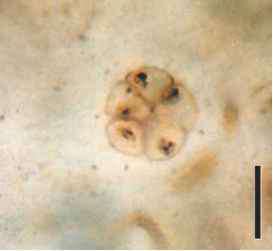 The fossil consists of septate hyphae and slightly sunken apothecia with asci; each ascus contains two bicellular spores (Jurina and Krassilov, 2002). Pelicothallos, found on the angiosperm leaf Chrysobalanus sp. from the Eocene of Tennessee, was originally described as an epiphyllous fungus (Dilcher, 1965) and later reinterpreted as an alga (Reynolds and Dilcher, 1984). The thallus bears setae and several dark fruiting bodies. On the basis of the spores and spore-bearing structures, Sherwood-Pike (1985) suggested that the fossil is similar to Cephaleuros (Trentepohliaceae), a genus of green algae that includes forms parasitic on land plants (Joubert and Rijkenberg, 1971), as well as those that function as lichen phycobionts (e.g., in the lichen Strigula). Indirect evidence of a cyanobacterial or algal-fungus symbiosis to form a lichen has been reported from Eocene amber collected from the Baltic region (Garty et al., 1982). This fossil is a multibranched thallus ~2 cm wide, with the individual branches 1 mm in diameter. On the surface of the thallus are several structures thought to represent aeration pores, apothecia, and spores. The fossil is encased in amber, and elemental analysis suggests the presence of sulfur, calcium, iron, silicon, and aluminum. The presence of certain elements in the fossil is suggested as demonstrating that the lichen accumulated iron and sulfur from the Eocene atmosphere prior to fossilization and thus can be regarded as a bioindicator of air pollution at that time. Other lichens have been described from Dominican amber (Rikkinen and Poinar, 2008), including a foliose thallus that morphologically appears similar to modern forms in the Parmeliaceae (Poinar et al., 2000). Additional indirect evidence of fossil lichens comes from the suggestion of Klappa (1979) that some laminar calcretes were formed by so-called lichen stromatolites. It has been known for some time that laminar calcretes (caliche), a type of calcareous soil deposit, contain algal filaments, fungal hyphae, and layers of organic-rich and organic-poor material, but the formation of these structures was not well understood. Lichens are known to be primary colonizers of rock surfaces, and the changes that they cause in their substrate represent the beginnings of soil formation. Klappa proposes that laminar calcretes are formed by a cycle of lichen colonization, followed by hardening of these biologically formed surfaces, followed by further lichen colonization, and so on. Over time, a layered structure, the so-called lichen stromatolite is formed. It is surprising that more lichens have not been described from the fossil record, since many of them, such as the foliose forms, have tissues capable of preservation. The recognition of well-preserved photobionts and mycobionts represents a major problem in the identification of these organisms since both are relatively fragile and may be difficult to recognize in permineralizations. In addition to a possible inability to recognize fossil lichens, another problem may simply be that the total number of lichens throughout geologic time was relatively small. Although many modern species reproduce asexually, which rapidly increases their distribution, the ancestral forms of lichens may have relied exclusively on the sexual mechanism of the fungus, a relatively slow way to distribute new individuals into the environment (Bowler and Rundel, 1975). In addition, many extant lichens grow in dry, exposed habitats, such as on bare rock surfaces, where the chance of fossilization is greatly diminished. Molecular sequence data from living ascomyc-etes involved in lichen symbioses suggest that not only have lichens evolved multiple times, but that lichens are far older than we once believed (Lutzoni et al., 2001). As more is learned about fossil fungi, algae, and cyanobacteria, obstacles to recognizing lichens in the fossil record and their geologic history may be substantially decreased. This is turn provides an opportunity to discuss not only the timing of lichenization through time but also the evolution of various structures unique to this mutualistic association.